Going to a concert the night before a race is never a good idea. The show never starts on time, you're going to be on your feet for hours, and you won't get home until well after your goal bedtime. Being the rebel that I am, making bad decisions the night before a race is always my idea of fun. As a result, my tickets for Friday night's Rihanna concert did not go unused. I'm kind of proud of myself for being an adult and leaving the show early to go to bed. Of course Riri didn't perform any of the songs I know until after I left, but that's what happens when the headliner doesn't go on-stage until 10:20pm. 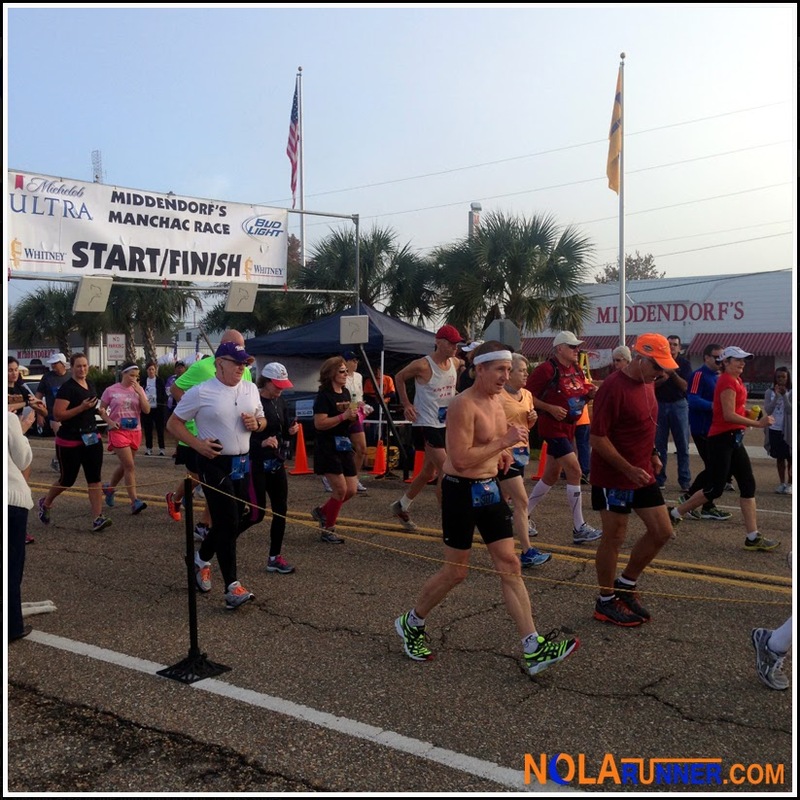 Getting to sleep shortly after midnight made it that much easier to wake up for the Middendorf's Manchac 10 Miler on Saturday morning. The drive was the least appealing aspect of the race when I decided I would register, but I knew there were several people I wanted to meet that were running. It was the motivation I needed to get on the road. After arriving in beautiful downtown Manchac, I realized that it really isn't that far to get to the race site. The first people I saw as I was walking up to pick up my number was Stephen, Ken and Nicole. Stephen I've run with previously at Sunday Runday and hung out with socially, while Nicole and Ken are Baton Rouge runners whom I've chatted with on twitter through mutual acquaintances. It was great to finally put faces to User Names. The 10 mile race allocated an early start of 7:30am for the race walking division as well as running participants who wanted a little extra time. Several familiar faces took off in this heat, including another friend I'll label "NOLA Nicole" for clarity. She gladly posed and waved for the camera, which you can see in the gallery coming to the NOLArunner Facebook page HERE. At 8am, the official starting gun fired for the 5K and the remainder of the 10 miler participants. Stephen and I started together, which is something I don't often do. Training with a partner is one thing, but running with one is another. He and I agreed that we'd stay together as long as possible, but if one or the other wanted to slow down, no hard feelings would be had. The two of us stayed together and chatted for 7 miles, staying consistent at a 9:09 mile. The sights on the course included trees, indigenous habitat (of both the alive and road kill kind), as well as perfectly staffed water stations manned by the women of Southeastern University. After the 7 mile mark, Stephen and I split up. He was running a comfortable pace, while I wanted to slow a bit to make sure I finished strong. The course started and finished with a significant hill / bridge that was nearly .6 miles in legnth, and I knew the pace I was keeping wouldn't allow me to crest it at full steam. Stephen stayed in my sights for the remainder of the race, and he grabbed photos of me crossing the finish line minutes behind him. Talk about the ultimate running partner. 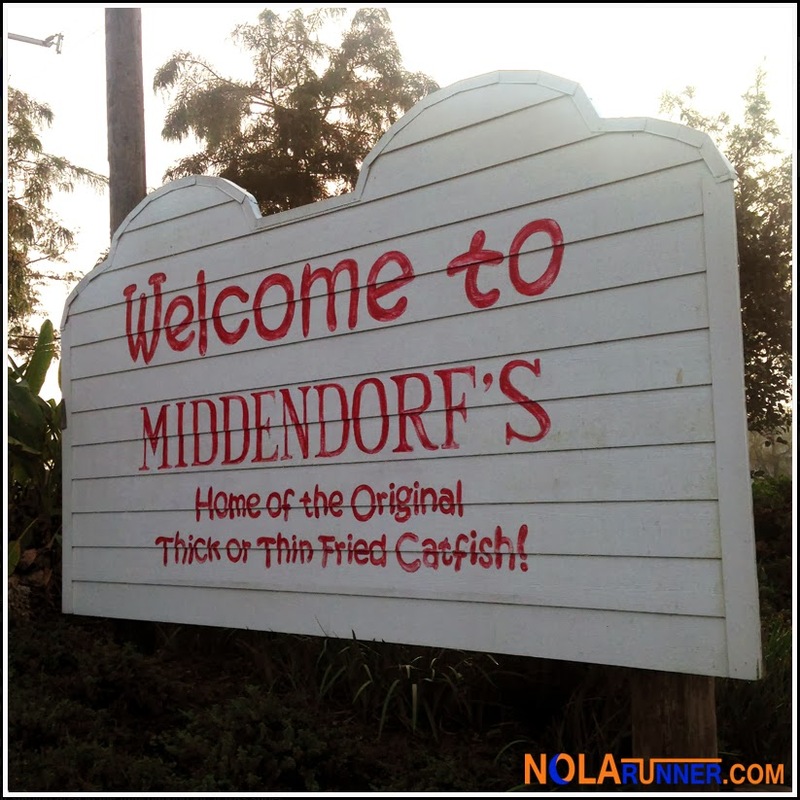 The only thing more I could have asked of Stephen would have been a piggy back ride to the post-race meal catered by Middendorf's. 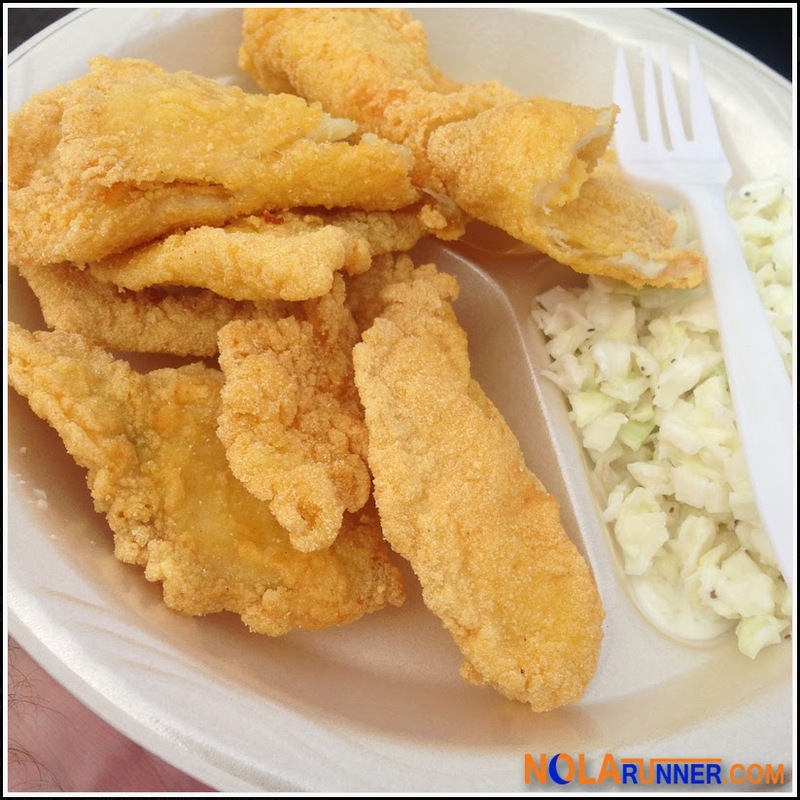 Against my better judgment, I indulged in a serving of thin fried catfish and coleslaw. It really was as tasty as I remember from visiting the restaurant with my parents over the years. I'm not sure how I feel about it as a post-race meal at 9am, but looking back, I'm certain I've eaten worse at weirder times. The hours after the race hit me like a brick wall with flu-like symptoms that I couldn't shake. They sidelined me for the remainder of the weekend, causing me to miss out on my volunteer opportunity with the NOTC on Sunday morning among other festivities. Apparently something's going around, specifically within the ranks of elementary school children and their parents. My friends with kids that I've hung out with in the past week, I'm glaring in your general direction. Thanks to you, I'm starting out my week by stocking up on Vitamin C supplements and antibacterial gels. That's the only way I know how to not get sidelined for training and the non-stop races to come.